Merry Christmas, everyone! I’m off to the airport… back on January 14. Philip J. Eby: I’m just not evil enough. I’ve been continually frustrated in my attempts to convince other people to use better tools—they seem to think most any time invested in learning to use tools won’t be recouped in productivity, or they just want to get their work done now without regard to reinventing the wheel or maintainability. Strikes me as rather short-sighted, but then again, I’m not the most productive programmer in the world. Using poor, buggy, or inconvenient tools just slows me down a lot, and increases my general frustration and annoyance level. I’m just glad I’m not alone! Bonus link: the CSE/CSAR 640-node Xserve G5 cluster, under construction across the street, is undergoing final assembly. It’s a smaller version of the Virginia Tech cluster, with Myrinet interconnection, though using plain old dual 2 GHz nodes with 4 GB RAM each. Photo album, Webcam, and some descriptions are here; you can often see people working on it during the day. I haven’t written too much about the software I use here in quite a while, so I’ll take this opportunity to mention some of it. Aside from working in Terminal and Emacs, I spend the most time every day keeping my to-do lists and project plans up to date in OmniOutliner. I take notes during and after meetings, write down ideas as I think of them, paste in my research results, and generally just make sure what I need to do is staring me in the face all the time. Religious use of OmniOutliner has made a huge difference to my productivity over the past year. The public beta of OmniOutliner 3 Professional was released yesterday; I’ve been testing it for a few months now. Overall, it’s heading in the right direction, with Omni’s typical attention to detail. My favorite new feature, by far, is the batch find; it’s terrific for searching through my archived status outlines. I’ve tried other outliners like TAO which have a lot more features, but they just feel so clunky that I couldn’t imagine using them all day, every day. While it’s pretty well suited for to-do lists now, OmniOutliner Pro still has a way to go before it can approach MORE’s feature set for document preparation. OmniOutliner’s keyboard navigation is still a little clumsy, and I miss the removal of Command-UDLR to rearrange headlines (the defaults are now Control-Command-arrows, and somehow I can’t reassign the “Move Left” command to command-L). While the style support is much improved, with some great visual indicators of what’s going on, MORE’s rules still seem a bit more elegant. The ability to embed links and graphics (PDF!) in a collapsable fashion is much appreciated, though, since I finally had to give up embedding graphics in MORE because of some Classic display glitches and the difficulty of getting MORE-compatible high-resolution images out of OS X applications. I’ve been reading about textSOAP for many years, but it took some prodding before I started using it recently. The software is easy to use and well-documented, and its author is extremely responsive and downright nice. I had wanted to add some features to ICeCoffEE to clean up text copied from Terminal, mainly stripping leading and trailing spaces. I was able to find a way to perform the appropriate cleanups with the then-current version of textSOAP, but a few days after I requested it, a new version was released which has the appropriate cleaners built in. Being able to put your custom cleaners into contextual menus (ICeCoffEE or not) makes them very convenient to use. Today Ranchero’s MarsEdit weblog editor was released. I’ve been using alpha and beta versions of MarsEdit to edit this weblog for several months, and find it very easy to use; the image uploading stuff doesn’t work because of some PyDS failings, but otherwise it’s great. Once again, there are some competitors with lots more features, but I find polished software a lot more compelling than that of the “everything but the kitchen sink” variety. 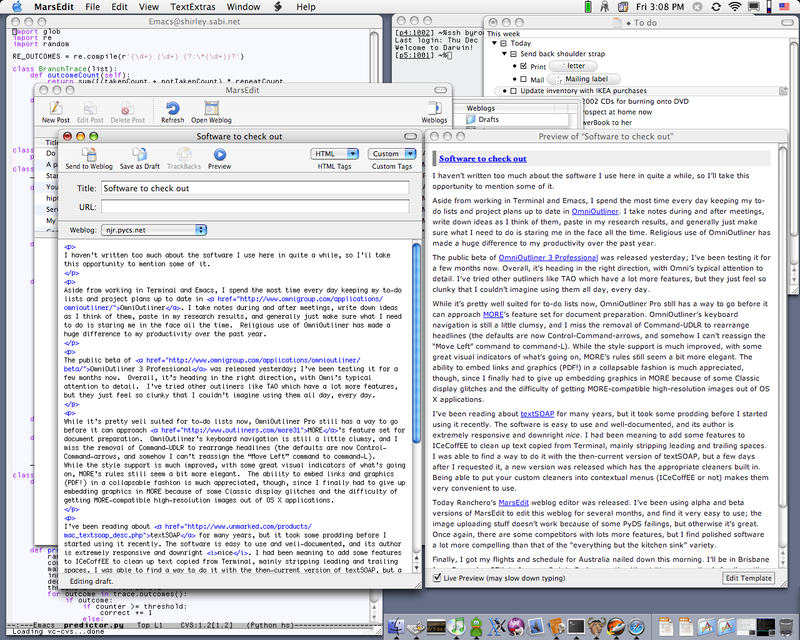 A screen shot of me using as many of the tools above as I could get to work at once is here. If there’s a moral I can derive from the past week, it’s above. I’ve been archiving my old data on CD-R since 1998; for the archives I made during 2001 and 2002, I printed carefully constructed labels from Illustrator using a Memorex brand CD label kit, and affixed the labels to the CDs. Thereafter, I got lazy and stopped doing that: for once, I am thankful for my laziness. The whole story: in the last week, I’ve been setting up my mother’s new PowerBook, which has a DVD writer in it. I’ve had access to DVD writers at school for many years (even a Pioneer DVR-S201 in my old lab, which took rather expensive blanks), but the combination of an easily accessible writer at home and cheap DVD-R blanks made it seem like time to start transferring my archives to newer media. I never expected all the CDs to be readable, but so far, there’s been a 100% correlation between the archive CDs with labels on them and lack of readability. There still remain five CDs from 2002 to try, but I don’t have much confidence in my luck with them. If you’re looking to salvage what you can off CDs with adhesive labels, I recommend using Retrospect’s Duplicate option—Retrospect constructs a catalog of the disk first, then tries to read each file in turn, so as long as the catalog is readable, it will do a good (though time-consuming) job. The most recent CD I tried took five hours to read, and I managed to get all but 100 MB of data off it. My initial attempts to use Finder copies ditto were much less effective, aborting at the first I/O error they encountered. Also, use a desktop, tray-loading CD-ROM drive, not a laptop or slot-loading drive, to read your old CDs; they tend to be more tolerant of discs which are unevenly balanced. The only CD with a label I’ve been able to successfully read, albeit with difficulty, in the new PowerBook’s drive is the MacHack 2003 CD; the older MacHack CDs and my archive CDs just caused the drive to stop the disc from spinning, after emitting a bunch of odd noises, and generate I/O errors thereafter. The NIST has some useful advice on the care and feeding of recordable discs—including, of course, the admonition not to use adhesive labels. I’m also burning two copies of each DVD now—hopefully at least one copy will last until my next media changeover.